BERSERKERBLADE: The Legion Wars Begin! Ok, so it's been a while and I haven't posted any updates. You know how it is: Life, work etc etc. So what have I been up to? Well, shortly after swearing off any new hobby projects and committing to painting the models I already own, I went totally nuts and started putting together a 1000 point Night Lords Legion army for the Horus Heresy. Building and painting has begun in earnest and I'm thrilled with how the VIIIth legion are turning out so far. I've also begun a small build-and-paint escalation campaign against Berserkerbro's Salamanders. Here's a little mid-battle photo of my Sergeant getting mown down by a bunch of scouts. Here's a very short piece of fiction I wrote to accompany the photo and commemorate his defeat. Sergeant Bathinko screamed as he bore down on the crouching scout. The vox caster built into his ornate helm amplified his screams into an inhuman roar. The Salamander reacted instantly, turning on the spot and unleashing hail of mass-reactive bolts. Most of the shots went wide, the few that struck home detonated harmlessly against Bathinko’s armour. As the scout drew his combat blade, Bathinko raised his chainglaive, the teeth of the brutal weapon whining as they cut empty air. His first stroke was a massive downward cut with both hands that would have cut an Astartes warrior clean in half had it struck home. The scout had anticipated his move however and stepped inside his guard jabbing viciously at the exposed cabling of Bathinko’s midriff with his blade. 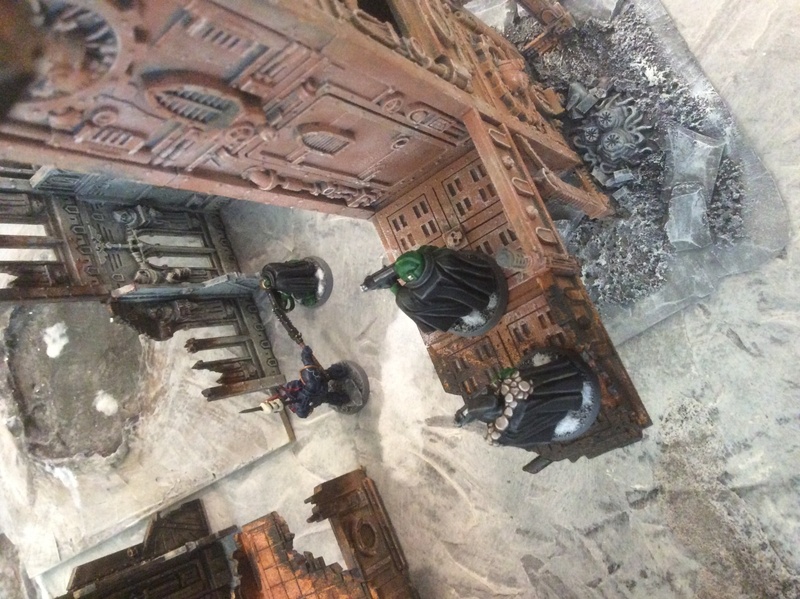 Bathinko’s retinal display lit up as his armour sustained damage to its power feeds and with another scream he swung the haft of his chainglaive outwards, knocking his opponent into the dirt. The Salamander reacted instantly, rolling to his knees and firing his bolter one handed. The single shot smashed into Bathinko’s faceplate scrambling his vision and severing one of the crests from his helm. Blinded and enraged, Bathinko swung the chainglaive downwards with all his strength. The pitiless chewing teeth sawed through the stock of the upraised bolter and into the torso of the kneeling scout. As his retinal display recalibrated, Bathinko’s sight returned. He looked down upon the savaged body of the Salamanders scout lying prone before him. His audio receptors picked up the distinctive sound of a boltgun slide being racked. Bathinko had just enough time to look up at the remaining two scouts aiming down at him from the gantry above. In the time it took him to draw breath he was bracketed by their co-ordinated fire; the barrage of shells shredding the grisly trophies attached to his armour and splintering the ceramite plating. One shoulder guard was completely torn away by the torrent; he tried to turn, to protect his head with the other shoulder guard only to be knocked to the ground, sustaining damage faster than his auto senses could track. Bleeding profusely from several serious wounds Bathinko used the last of his strength to draw breath and screamed.